Pancakes are a simple, good thing. But, that being said, there are a lot of ways to mess a pancake up. I've witnessed my fair share of pancake disasters and disappointments. To me, the perfect pancake is fluffy, light and a bit chewy. If that's your idea of pancake heaven - then please, heed my advice on how to make the most delicious pancakes ever! 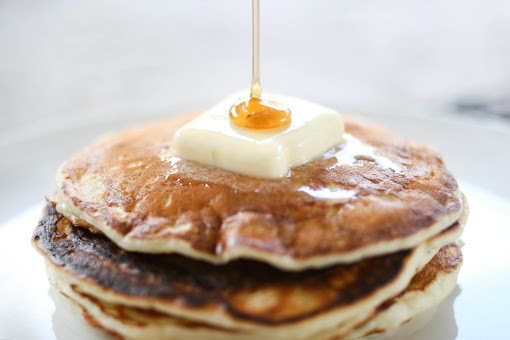 My favorite buttermilk pancakes are down below, but you could apply these tips to any pancake batter you desire to make an awesome Sunday brunch. 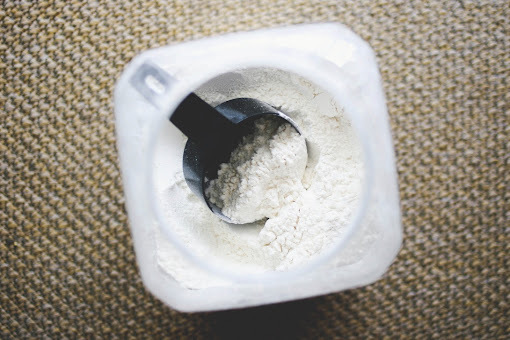 (1) Fluff your flour. Fluff you say? Yes. Anytime I measure flour, I always make sure to lighten the flour by "fluffing" it, just to make sure I always measure the right amount of flour. 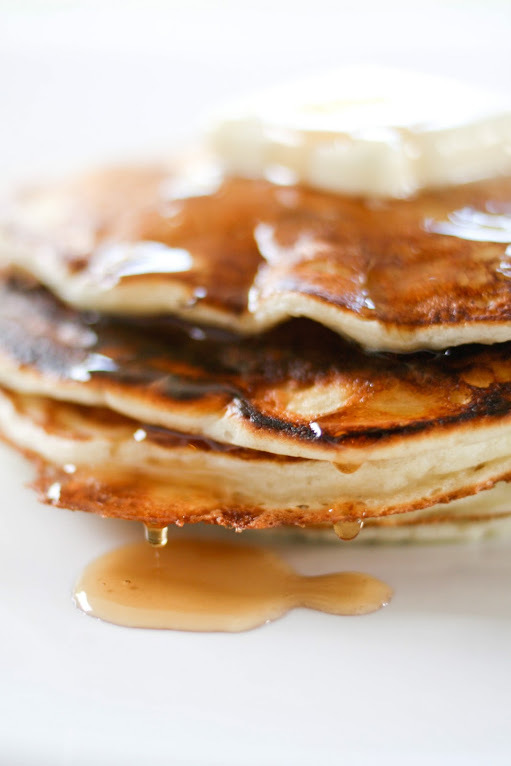 Not fluffing your flour could result in pancakes that are too heavy - and we don't want that at all! See! Flour that is light and fluffy! (2) DO NOT, I repeat, DO NOT over mix your batter. The most important cardinal rule of great pancake making is do not over mix your batter. The best way to make pancakes is to make a well in the dry ingredients, add the wet ingredients in the center, then slowly swirl the two together until just combined. Lumps are perfectly fine - in fact, lumps are very much welcomed. (3) Grease your pan. Cooking spray is your friend. I find it the easiest way to grease your pan and the most effective. 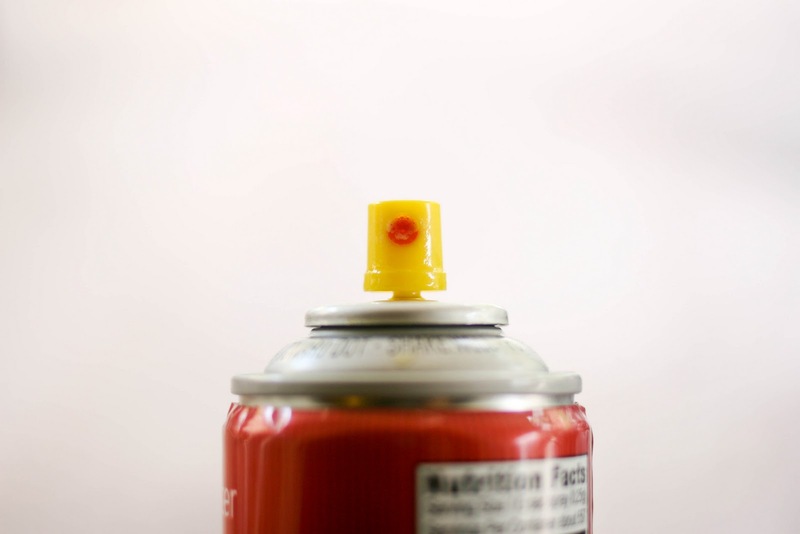 If you don't have cooking spray on hand, butter or vegetable oil should be fine too. Just use it to lightly coat the pan so your pancakes will come off like a dream. (4) Low and slow... is the name of the game. 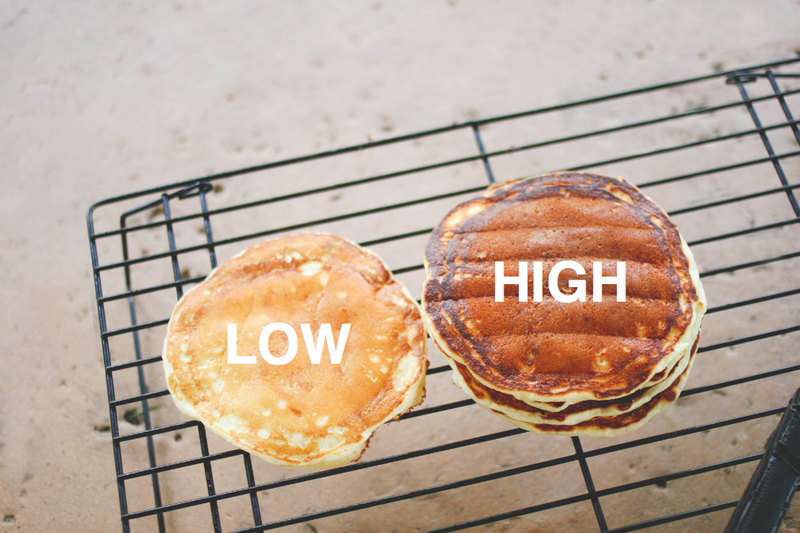 Although cooking on high flame might get the job quicker, the best way to cook pancakes is on medium-low heat so that the pancakes can cook evenly. As soon as the edges of the pancakes start to lose their shine and bubbles start to rise to the top of the pancake, it's time to flip! (5) Don't press your pancakes! 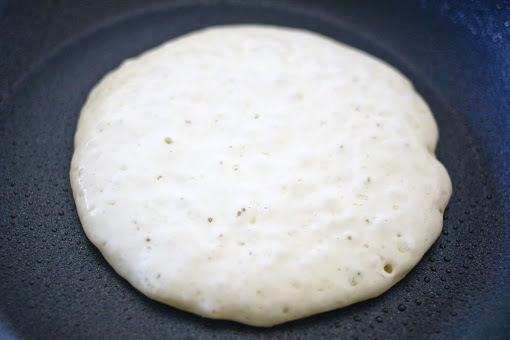 Pressing your pancakes will not make them cook any faster and plus, you'd be ruining all the effort you put into your pancakes to make them light and fluffy. If you feel the urge - RESIST! The results of low and slow cooking (on the left) and high temperature cooking (on the right). (6) Don't stack em. 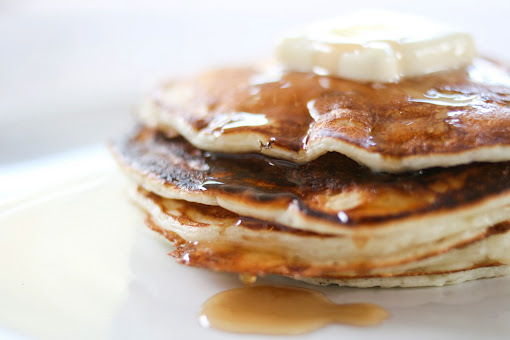 Pancakes are meant to be stacked only if you eat them right away! 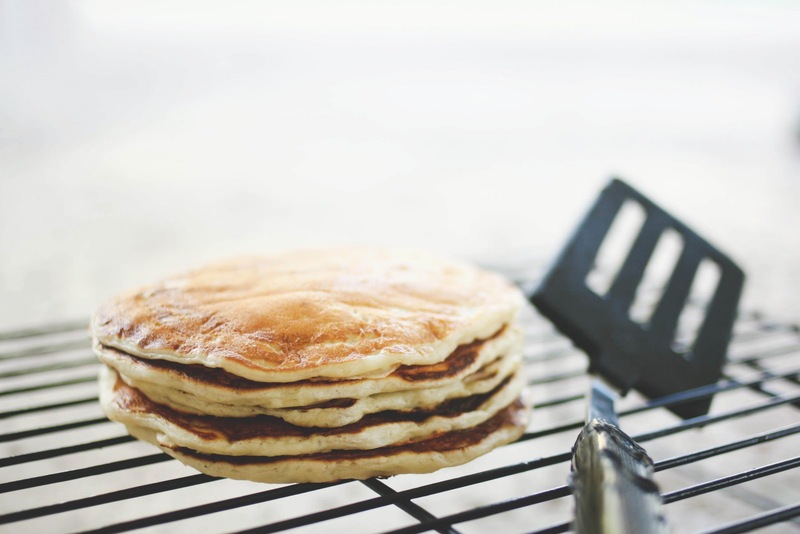 The best way to eat pancakes is to eat them straight off the griddle but if that's not a possibility - resist the urge to stack your pancakes! The heat from the pancakes will cause them to sog each other up and we wouldn't want soggy pancakes would we? (7) Racks are your friend. Again, if eating pancakes straight off the griddle isn't a possibility, cooling racks are the best way to house fresh pancakes. 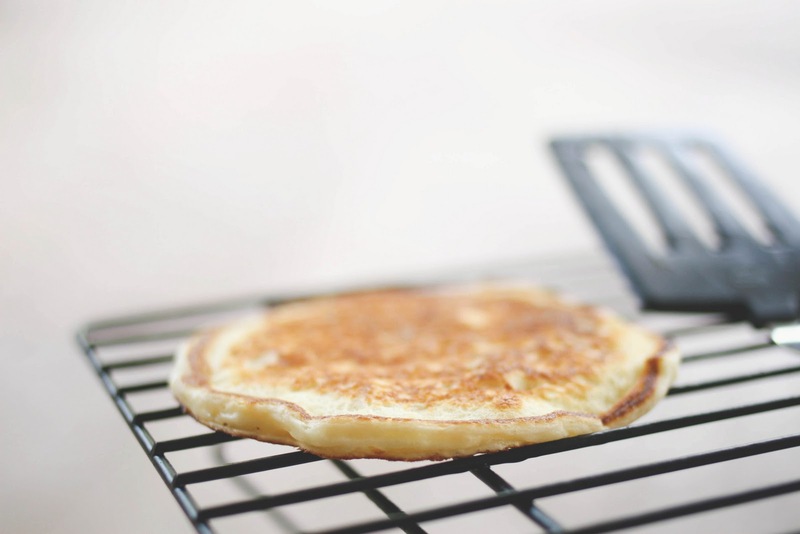 Straight off the pan, arrange your pancakes in a single layer to allow the pancakes to cool. Before eating, re-warm the pancakes in a low-temperature oven (about 200 F). (8) Bask in pancake bliss. 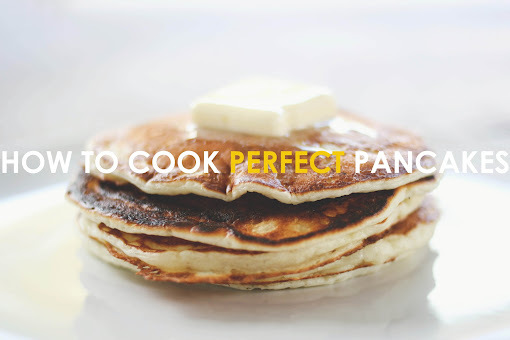 Perfect pancakes are only perfect if they are enjoyed. So chow down! Butter and maple syrup are necessary! Now, on to my favorite pancake recipe. I have made plenty o' pancakes and I've loved them all - from chai flavored, matcha flavored, pear filled, chocolate chip studded and more. 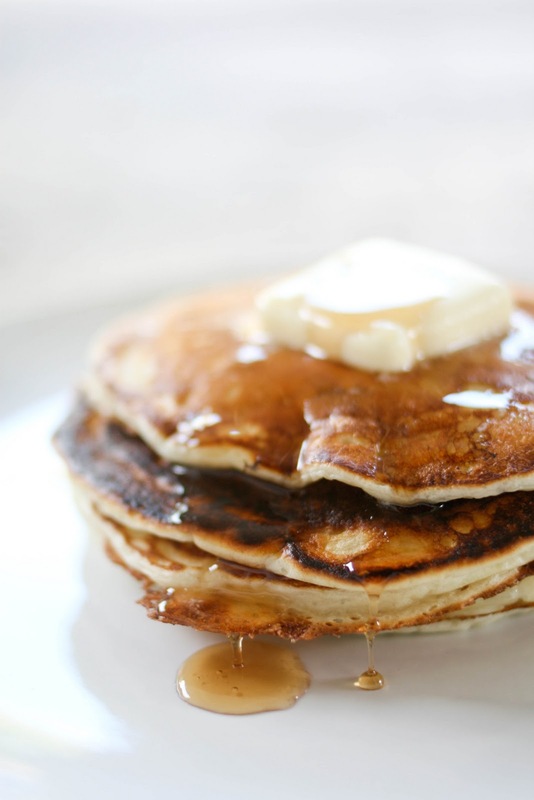 But, simple, fluffy buttermilk pancakes are a special tool that any home cook can use in their arsenal. These pancakes are awesome, basically. They're incredibly light, fluffy and easy to make. I think it's the mixture of buttermilk and sour cream that makes them extra tasty! 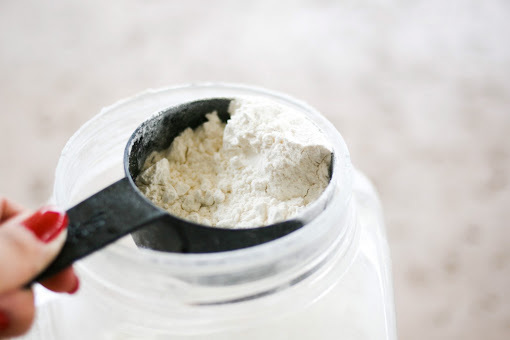 Whisk the flour, sugar, baking powder, baking soda and salt together in a medium bowl. 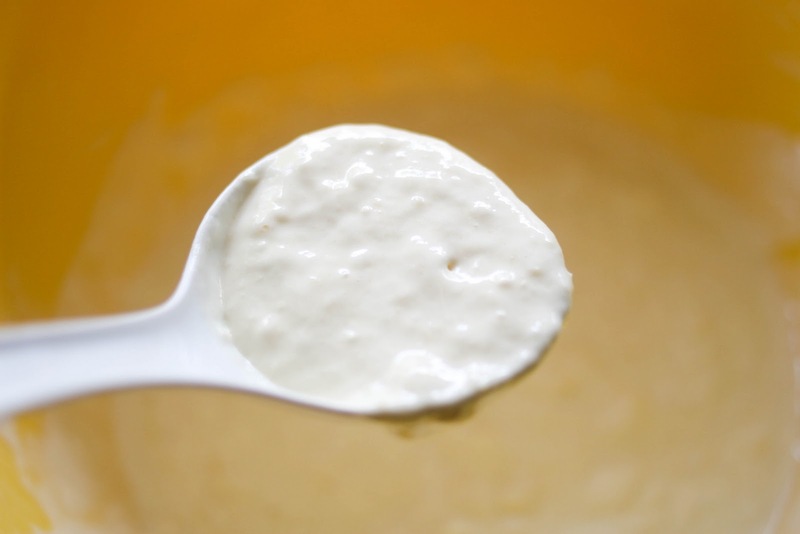 In another medium bowl, whisk together the buttermilk, sour cream, eggs and melted butter. Make a well in the center of the dry ingredients and pour in the wet ingredients and gently stir until just combined - do not over mix! Allow the batter to sit 10 minutes before cooking. Heat 1 tsp. of vegetable oil in a nonstick skillet over medium heat until shimmering. Using a paper towel, carefully wipe it out, leaving a thin film of oil on the bottom of the pan. Pour 1/4 cup portions of the batter on the hot pan and cook until the edges are set, the bottom is golden brown and bubbles on the surface are beginning to break, about 2 - 3 minutes. Using a spatula, flip the pancakes and cook until golden brown, about 1 - 2 minutes. Repeat with remaining batter and serve immediately. 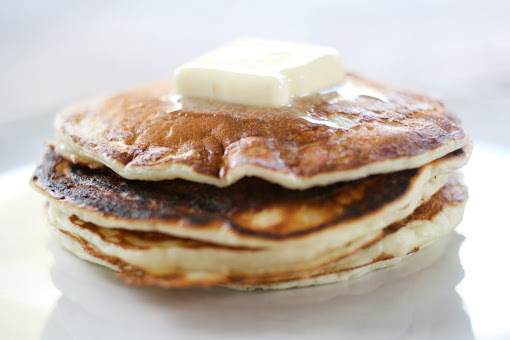 This is another amazing pancake recipe that only uses buttermilk, so if you don't have sour cream - these will automatically make breakfast fabulous! Preheat a griddle over medium heat. In a medium bowl, whisk together the dry ingredients; set aside. In a large bowl whisk together the wet ingredients. Combine the wet and dry ingredients, being careful not to over mix. Throw some water on the griddle, if it sizzles, it's ready. Turn down the heat to medium-low and grease the griddle with cooking spray. Ladle the pancake batter onto the griddle and cook until bubbles start to arise to the top of the pancakes and the edges lose their sheen. Flip, then cook until golden brown. I love pancakes. Most of your tips are things I already do but I always stack them and it makes sense not to now! Thanks so much for sharing! Hmmm... Pancakes! I like them best with apple slices inside, and I'm definitely trying your sour cream recipe next time. YUM! I always stack mine so thanks for the tip! My secret to perfect pancakes besides the obvious of not overmixing is to whip up my egg whites. Have you tried Clinton St. Bakery's pancake recipe? I'm always on the search for the best recipe and I think I found it in theirs! @ Helen: OMG I love the Clinton St. Bakery pancakes!!! If you have theirs can you please share!!! I came across this recipe while researching for a pancake party I was doing tonight for Shrove Tuesday. I made the perfect pancakes tonight! Totally brilliant pancakes. Thank you for the tips! I'll never make mediocre, soggy, unfluffy, undercooked, burnt pancakes again! I try your first recipe & its turn out PERFECTY! Just a girl trying to find some peace of mind... and maybe a piece of cake. More about me and this blog here. 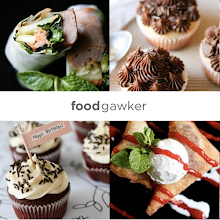 Part of this blog will be dedicated to my adventures and misadventures in food. Let's just say I'm a girl who knows how to eat. 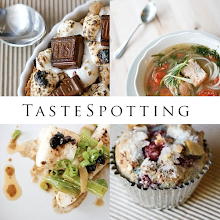 I love to experiment with new recipes and new restaurants so this blog is just a way to share my journeys in food with whomever is interested. The other part will be my random rants about music that I enduringly and currently love. Just me, doing my part in spreading the joy of good music to those willing to listen.